I started planning a piece on the upcoming proposed Youngstown Community Bill of Rights charter amendment. For timing reasons, with respect to the November election and in lieu of developing stories, that piece will appear in next month’s “Mike On Frack.” Instead, I have chosen to address two recent stories that hopefully have no correlation — but just may in the future. The first story is the recently released Lamont-Doherty Earth Observatory study by Dr. Won-Young Kim, which attributes 109 tremors in the Youngstown-Girard area to the shuttered Northstar 1 deep injection well located on Ohio Public Works Drive. The tremors studied occurred between December 2010 and February 2012. The second story of interest is the announcement of two new permits for deep-injection wells in Vienna Township. 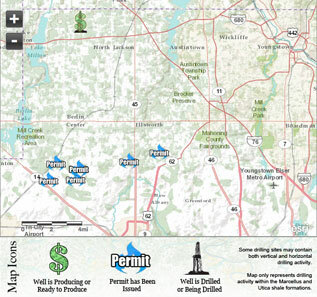 These new wells are not much farther than the 7-mile ban around the Northstar 1 well imposed by Gov. John Kasich after the 3.9-magnitude earthquake that occurred on New Year’s Eve in 2011. Avid Vindicator readers may recall an article that appeared in the paper and online Jan. 31, 2013. This article, headlined “Girard residents report hearing a ‘loud boom,’” reported that a number of people in Southern Girard felt repeated, unexplained booms and shakes within a day or two of when the article ran. The Lamont-Doherty study goes a long way in potentially explaining this unexplained phenomenon. A request was made to get the actual dates and times of the tremors and any related magnitude measurements associated with the tremors in the Kim study. While these unexplained quakes and booms were being reported by Girard-area members of the “Girard Website” Facebook group, I requested people post the dates and times of when they heard or felt seismic activity. Cross referencing these citizen reports with the tremor-incident data from Lamont-Doherty just may prove interesting. Another interesting Vindicator article by Ed Runyan, dated July 21 and headlined “Two injection wells proposed for Vienna Township,” detailed the concerns of township Trustee Phil Pegg with respect to the impact on traffic that the new injection well — located on Warren-Sharon Road — could have on Sodom-Hutchings Road. Also mentioned was another injection well permitted off state Route 193 just south of the Youngstown-Warren Regional Airport. The Gray study indicated that there are undoubtedly other faults in Northeast Ohio and western Pennsylvania that have not yet been discovered. These faults are the result of compression and shallow thrusting from continental collision when the Grenville Province collided with North America and created the Grenville Mountains more than 800 million years ago during the Precambrian Period. In a previous “Mike on Frack” of March 13, 2012, headlined “Who’s At Fault?,” it was pointed out that Ohio Department of Natural Resource’s preliminary report on the seismic activity in the Mahoning Valley during 2011 indicated there were no fault lines mapped in Mahoning County. Gray’s 1982 study clearly documented a fault line in Mahoning County’s Smith Township. I am hopeful ODNR has improved its science in locating these potential local faults since the NorthStar 1 incident. The lives of real people are greatly affected by this seismic activity.